The SeaDream II (and its twin sister the SeaDream I) are the world's best boutique-sized luxury cruise ships. It sails the Mediterranean in the summer, but is most appealing when sailing the Caribbean in the winter. Note: My section focuses on the Caribbean. And I refer to the SeaDream II on these pages simply as "SeaDream". My top 10 list is based on my onboard experiences and my interviews with passengers. Because the SeaDream accommodates only 112 passengers, a pleasing rapport among them quickly develops. Your cruisemates are educated and well-traveled. They are more adventure spirited than typical cruisers. Many have sailed the SeaDream two or more times before (a satisfaction indicator). Most passengers are career-active, not retired. The age spectrum usually runs from 25 to 70, with 35 to 60 the average. There is much to do on the SeaDream - but without an overly structured schedule. Examples: Swim, jet-ski, kayak, and water ski directly off the ship's onboard marina. Leisurely dine with your family and friends indoors or al fresco. Socialize in the bars and main lounge. Laze on the outdoor Bali Beds on the top deck. Read my Onboard activities and spaces and Dining and Watersports pages. They are spacious, comfortable and stylish, and well-appointed. Read my Onboard activities & spaces and Dining pages. The SeaDream staff gives professional, attentive and personalized service. You're an individual, not a face. I believe the term "Cruise Ship Yacht" better describes the SeaDream than "Cruise Ship" because the low guest count fosters camaraderie. View the Deck plans. It's smart, stylish casual - as befits a refined, relaxed cruise. You won't see tux-clad passengers onboard a tropical cruise. Neither will you find sloppily dressed cruisers. Although the SeaDream fare is higher than average, almost everything is covered. This includes meals, premium drinks, tips, and watersport toys. Those items are extras on most cruises - and add up quickly and substantially. 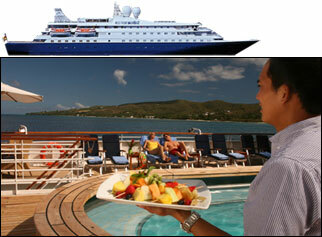 And you won't be enjoying the quality of the SeaDream's food, service, cabins, public spaces, and overall experience. Operating a cruise ship is complex with countless opportunities for something to go wrong. Not even a luxury cruise ship - including the SeaDream - can be perfect. However, the shortcomings I detected (such as a forgotten toast order at breakfast) were minor. If you love huge ships with flashy entertainment, big casinos, glitzy decor, people-filled public spaces, and partying till dawn. If you like highly structured onboard activities such as bingo and goofy poolside contests. If you don't mind waiting in long lines and hearing frequent public address announcements. Click Seadream Yacht Club to visit its website.